During our lives we suffer several metamorphoses, some are painful, others are positive, chosen or not. The experience, the life itself, makes us change and evolve. My story is not different, although my most radical metamorphosis was when I fell ill with Multiple Chemical Sensitivity. But although I got sick suddenly, the process itself happened slowly. I was preparing for MCS for many years before I was aware of it. My body was warning me repeatedly without my understanding what it wanted to tell me. But how could I know that everything happening to me was the prelude to MCS? It’s almost impossible to know since information about MCS is kept secret from the public and when anyone dares to raise a voice, they are automatically silenced by those who say MCS is all in the minds of the patients. It’s not easy to understand what happens to you as you search for a diagnosis, all the while trying not to fail during the long journey while you are riddled with attempts to damage your self-esteem as you struggle with a more diminished health status every day. The last stage of this particular metamorphosis happens when you finally know what it is happening: you have MCS. And then you start to reconsider the life you have known before in order to adapt yourself and to survive into the future. All of us have gone through the stage of crying over things that we have lost, to hate what we have become. Where is that tireless and impulsive person who took the world by storm? It’s a natural, healthy and necessary stage. But oddly, then comes the most difficult thing: to find our place in this new world in which we’re doomed to live. And surprisingly, when I thought that my life couldn’t be more foreseeable and monotonous, from the prison that my house has become, another metamorphosis started, this time deeper and visceral. This time my metamorphosis was chosen. The need to communicate, to let the world know that I’m still alive, to cry out for my own rights and the rights of millions of people who suffer MCS in the whole world, led me to write. My timid voice started to be heard on my blog, No Fun, and then gathered strength thanks to Delirio’s articles, which were translated into several languages. 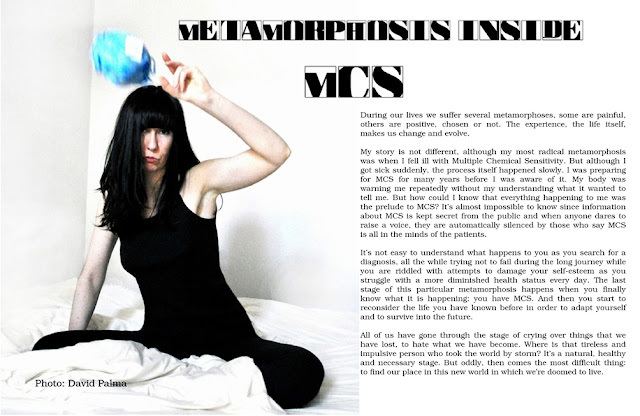 And the first of them, “The Naked Truth about MCS,” was read on the Spanish Radio 3 program Carne Cruda. It was then that I finally dared to do something I had never imagined I would ever do: to write a book. The extremely reserved person that I used to be has disappeared, in order to be able to tell my story to the world, as I dig into the deepest places of my being. Missing: A Life Broken by Multiple Chemical Sensitivity is a fulfilled wish as I report the situation in which we live. It’s my metamorphosis inside the metamorphosis of living with MCS. It’s my testimony, my life, my reflections. It’s also my contribution to the fight we’re doing at an international level to have MCS fully recognized. My book is the clearest proof that MCS didn’t take away my essence or my attitude; MCS didn’t steal my dreams but rather it changed my dreams so that I could help others. My wish is that a lot of books will be written by people who are “missing” because of MCS so that the public knows we exist. We are ill, but no one will silence us.